If you’ve ever been to Mackinaw City, there’s a good chance you’ve tasted Murdick’s Famous Fudge. 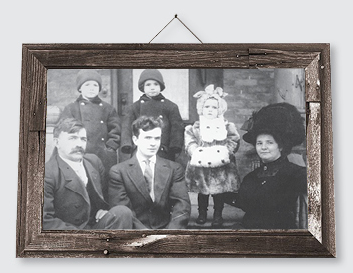 The store is now owned by fifth-generation candy maker, Aaron Murdick. Michigan Retailers Association presents centennial plaques to businesses who hit the extraordinary anniversary. Murdick’s is overdue for the honor. In 1887, sail-maker Newton Jerome Murdick was commissioned on Mackinac Island to make awnings for the newly constructed Grand Hotel. 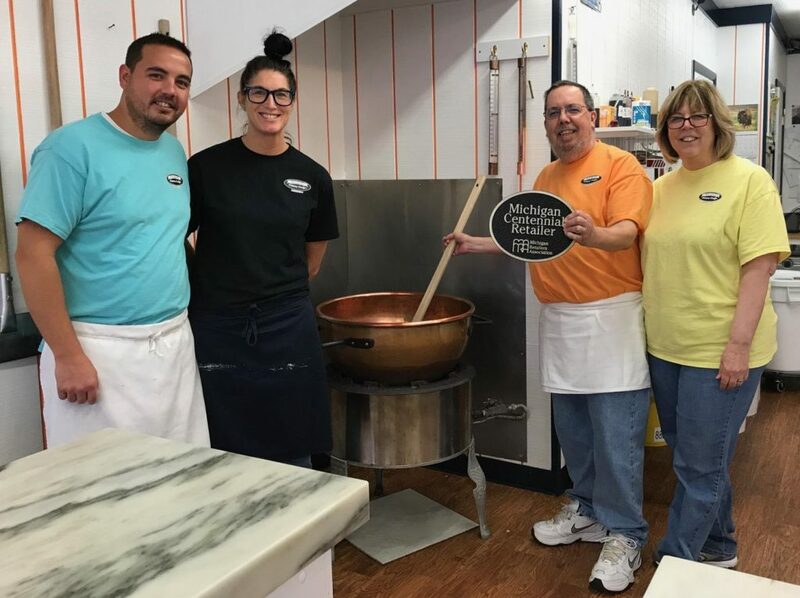 He took a chance when he saw the tourism opportunity and opened Murdick’s Candy Kitchen and began his fudge-making career. In 1922, the store changed names to Murdick’s Famous Fudge. Through their 130+ year history, the Murdick family opened stores in Charlevoix (1954), Traverse City (1960) and Mackinaw City (1980). 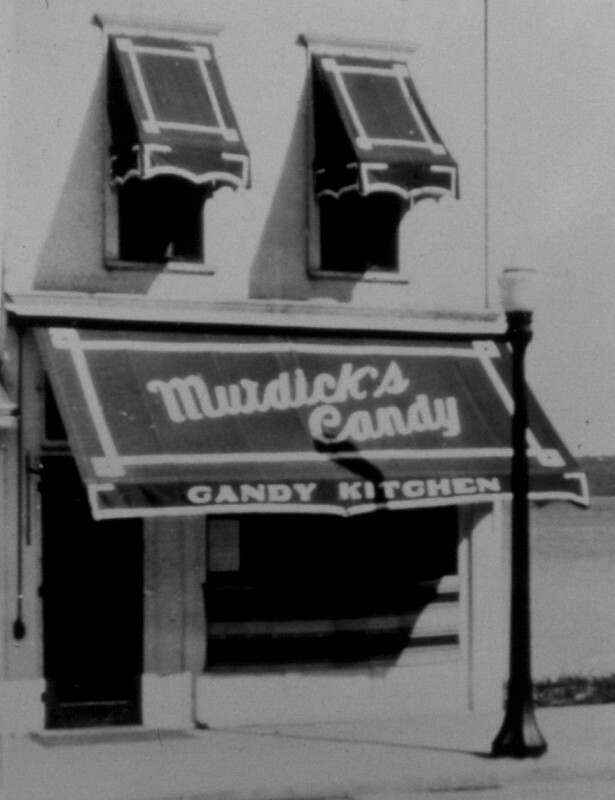 In 1969, the Mackinac Island location was sold out of the family, and the island store’s name was changed to Original Murdick’s Fudge. 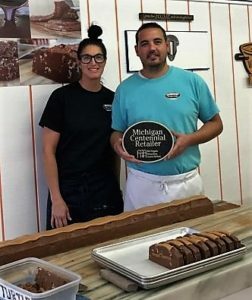 The locations operated by a member of the Murdick family are: Murdick’s Famous Fudge in Mackinaw City, Murdick’s Fudge Frankenmuth and Celeste Murdick’s Fudge in Charlevoix, owned by John Murdick’s sisters, and Doug Murdick’s Fudge, owned by John’s cousin, Doug, in Traverse City. The journey wasn’t always easy. During the World Wars, sugar was rationed to help the troops overseas. The store made as much candy and fudge as the limit would allow and typically would sell out within hours after opening. After WWII, Mackinac Island became a middle-class tourist attraction, bringing more families to the Island and expanding the popularity of the fudge store. Although Murdick’s Famous Fudge closes its doors a few days before Christmas, Aaron and John still make fudge for mail orders through the Christmas season. They typically reopen in the last week of March. But this year, when the Mackinac Straits were visited by blue ice (when light is reflected through the ice causing a blue hue), they opened in February to accommodate the surge of tourists who arrived to witness the natural phenomenon. L-R: Owner Aaron Murdick and his wife, Kristine, along with his parents, John and Marcy.